Natural gas bunkering in the United States will develop incrementally, according to the latest Energy Information Administration (EIA) assessment. In a survey of the impact of the more stringent cap on bunker fuel worldwide, which starts on January 1, liquified natural gas (LNG) bunkering is allocated a small role in the post IMO2020 marine energy market. 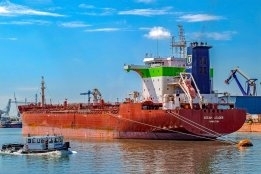 "The EIA expects the use of LNG in US marine bunkering to be limited in the next five years, reflecting the limited infrastructure available to accommodate LNG bunkering at US ports," the report said as quoted by Hydrocarbon Engineering. "As infrastructure adapts, LNG's share of US bunkering grows to 7% in 2030 and to 10% in 2050," it added. Outside of the Americas, LNG bunkering demand is expected to move at a similar slow pace. Northern Europe is seen as having potential for growth. For ships, LNG must be broken down into smaller parcels. The use of small-scale LNG on land is already established in Scandinavian countries while a clutch of north European ports express enthusiastic support for the alternative marine fuel. However, in all markets, the existence or not of the relevant infrastructure is seen as the main constraint on demand growth.